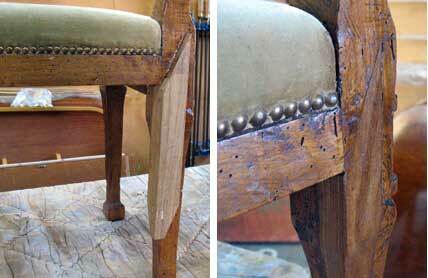 This antique Italian chair arrived at my workshop with a broken leg, the result of a persistent attack of woodworms that had not been dealt with. 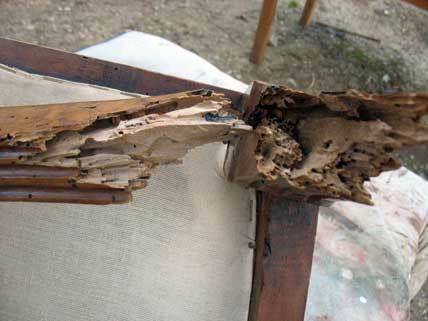 This occurs quite often in antique furniture because of repeated invasions over the relatively long lives of the pieces. Woodworms leave a hollow tunnel in place of the wood they have eaten away, making the wood brittle and susceptible to breakage and other serious damage. 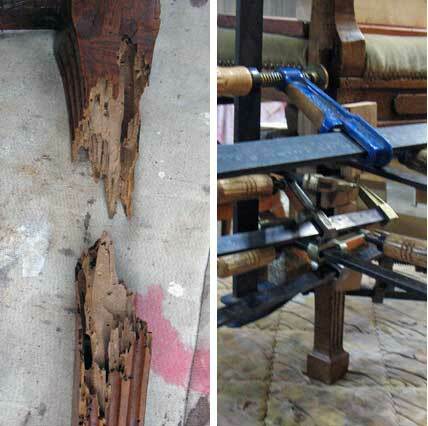 The impact of woodworms is common in antique furniture and paradoxically even adds to some extent to the beauty and authenticity of the piece. For this chair a wooden support was inserted where very little wood was left to enable the leg to survive the weight of a siggint person.